Kym Deyn is poet, playwright and fortune teller based in the north east of England. They are the current president of Durham University Poetry Society as well as being the co-founder of Durham's award winning slam team, which won Slam of the North 2018 and placed third overall at Unislam 2019. 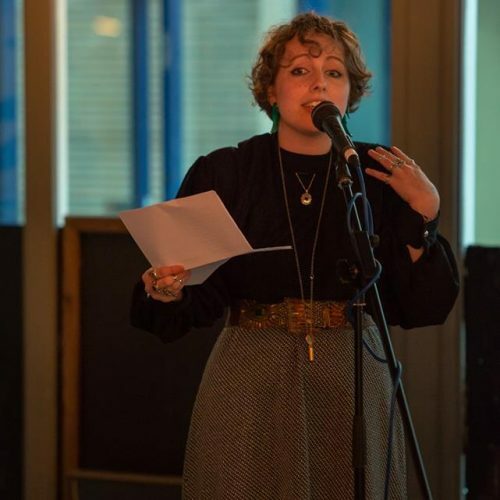 They have been shortlisted for several individual awards including the Terry Kelly Poetry Prize, and the West Yorkshire Playhouse "Airplays" Competition, and they were recently longlisted for the 2019 Outspoken Poetry Prize. Their work has appeared online as well as in print, for instance, as part of the Mechanics Institute Review and in Introduction X by Smith|Doorstop books.